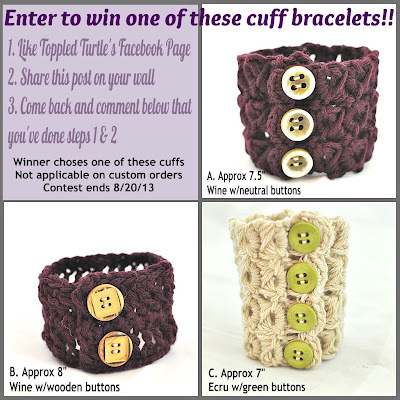 Toppled Turtle: Cuff Bracelet Giveaway!!! The other week, I was working on some reorganization of my Toppled Turtle stash. I kicked the girl's toys out of the living room built ins and reclaimed them as my own. I was sick and tired of ducking into the closet, behind the coats, to access my stuff. While I was going through everything. I came across 2 cuff bracelets I made back when I first started working out patterns for them. Fast forward a couple of weeks and I found myself in a position of needing to rework a custom order cuff to make it wider (the customer had very specific needs and the first cuff missed the mark slightly). As a result, I now have 3 cuff bracelets on my hands. I really like to custom make these to fit each order rather than keeping inventory so I've decided to do a quick and dirty giveaway! To enter, here's what you need to do. 1. Proceed to Toppled Turtle's Facebook Page and like us there! 3. Comment on the giveaway post that you've done both of those things. The winner gets to choose the in stock cuff bracelet of their choice. 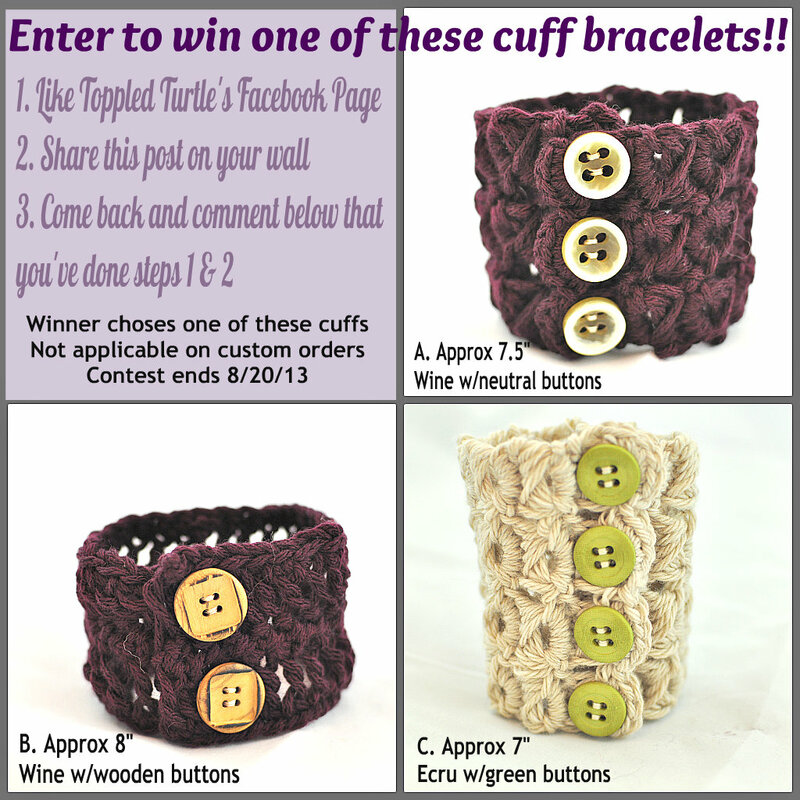 Contest ends 8/20/13 - winners will be announced on Toppled Turtle's Facebook Page.